A cataphoretically coated Cityliner frame undergoing panelling. 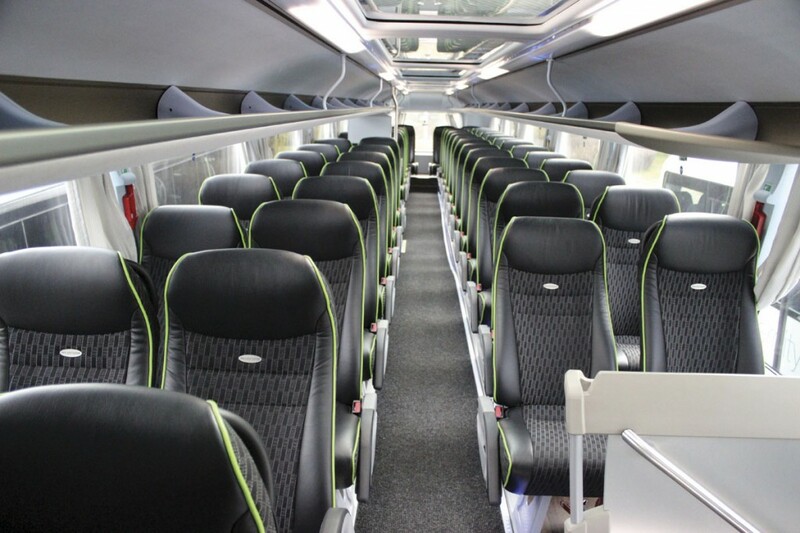 The interior of the 12.3m Intercity. 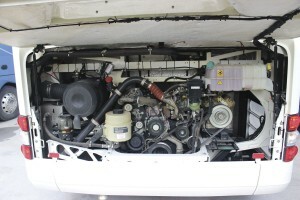 The 6.87-litre D0836 engine in the MAN Lion’s Intercity. 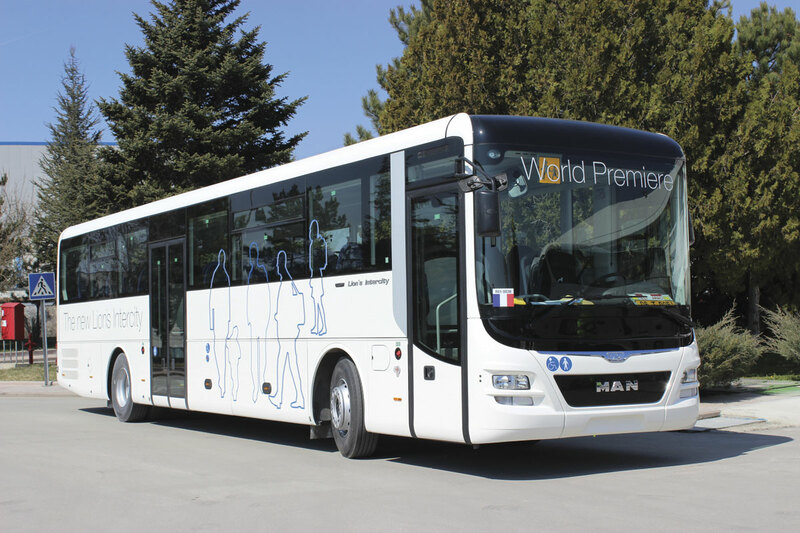 In past years MAN’s bus division has usually held its Bus Days, a chance to meet up with operators and members of the press and display its wares, at the Bus Forum at its headquarters in Munich. 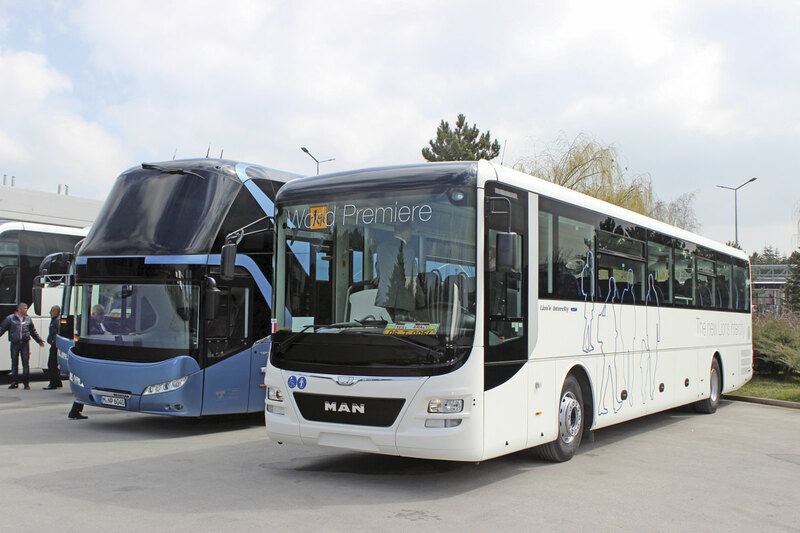 This year, despite the logistical challenge it represented, it chose to stage the event in the Turkish capital Ankara, home to the factory that builds all of its complete MAN and Neoplan coaches and is capable of building every vehicle in the range. A number of UK operators were among the 800 present for a gala evening event but the main draw, and the reason for taking people such a distance, was to show off the investment made in the Ankara facility and demonstrate both its broad capability and the very high standard that it is working to. It is a time of change within MAN. There is inevitably a degree of anticipation tinged with uncertainty about what the appointment of former Daimler commercial vehicles boss Andreas Renschler as member of the Board of Management of Volkswagen AG with responsibility for commercial vehicles will mean for MAN and Scania and their respective futures. 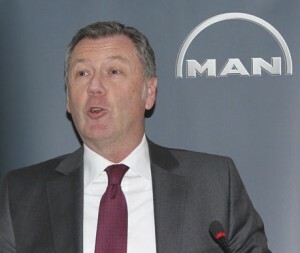 It is compounded by the move of former CEO of MAN Truck & Bus AG, Anders Nielsen, to Volkswagen to work under Renschler taking responsibility for business development and his replacement by another former Daimler man, Joachim Drees, as MAN Truck & Bus AG CEO. 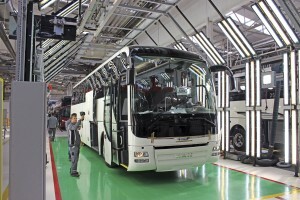 Added to the senior personnel changes is the major restructuring of the bus and coach manufacturing operations that will rapidly see the consolidation of MAN and Neoplan bus manufacturing from the current four plants down to two. 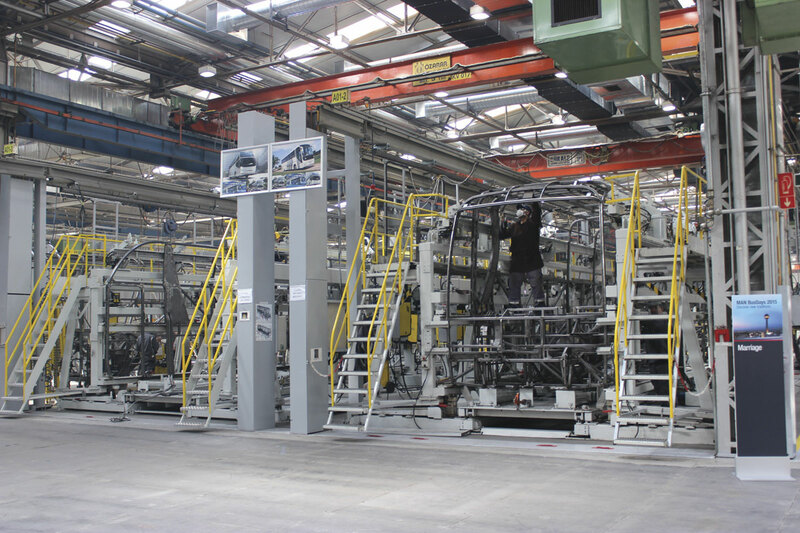 The plant at Plauen in Germany is to cease complete vehicle production in the coming weeks, though it will have an important ongoing role within the group, and similarly, the current facility at Poznan in Poland is to cease completing buses. 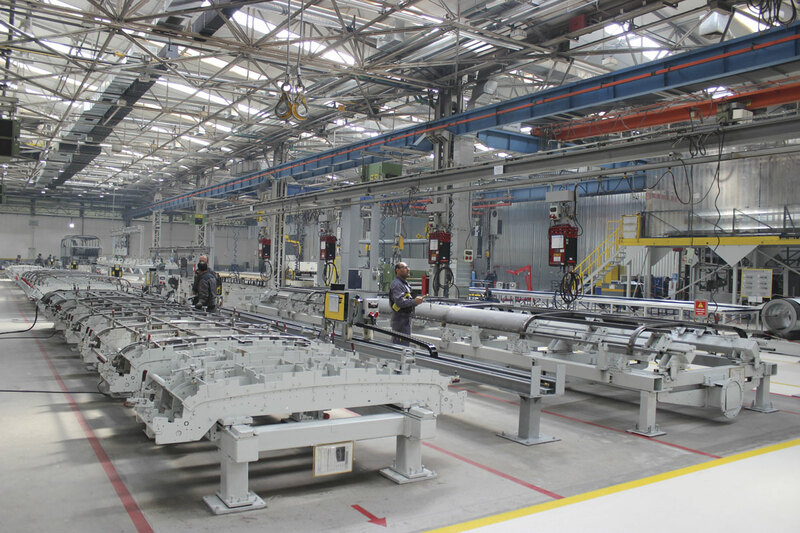 In future low floor bus production will be switched elsewhere in Poland to the plant at Starachowice where the frames are already produced. This process will be complete by 2017, after which time all bus production will be at Starachowice and all coach manufacture in Ankara. Welcoming journalists to the event, Heinz-Jürgen Löw, who has just completed his first two years as Director Marketing, Sales & Services of MAN Truck & Bus AG, having previously been President of Renault Trucks, said that MAN’s product vision was that ‘We produce the best quality products with passionate people and efficient resource deployment. Our factories share a common vision of lean standards as well as safe and healthy work conditions.’ There was a three-fold quality, customer orientation and efficiency based production philosophy. Quality came first in both products and processes; customer wishes required that deliveries were on time, that individual operator’s needs were satisfied; and efficiency required efficient industrial processes with short cycle times and stable, flexible, production. He promised a focus on customer satisfaction, a major stress on personal contact with customers and customer consultation on their requirements and on solutions to meet them. Aftersales service efficiency would mean solving problems first time. 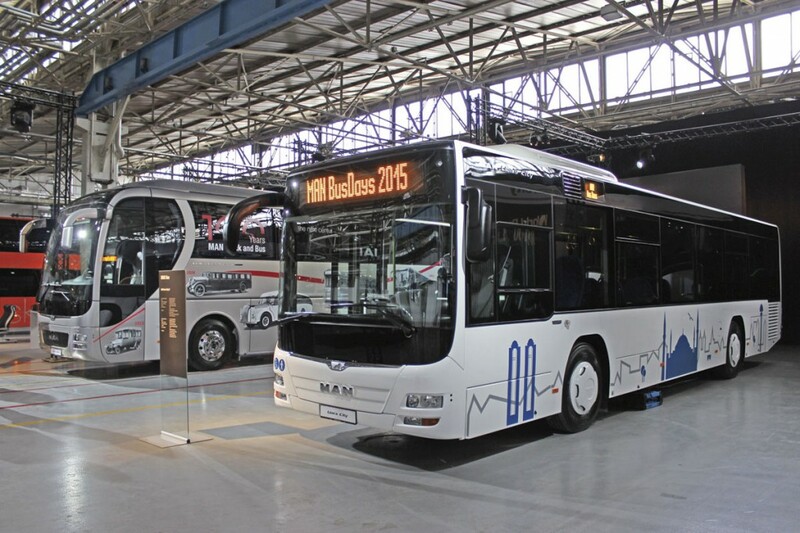 MAN AS first started building trucks at a plant in Istanbul in 1966, producing its first buses two years later. In 1985 a new plant in the Turkish capital, Ankara, was built and after initially building both trucks and buses, it now specialises solely in buses and coaches. 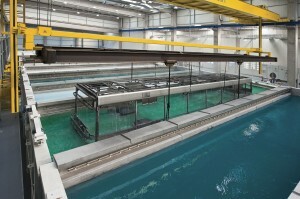 2011 saw the installation of a new state-of-the-art cataphoretic dip process to protect the vehicles against corrosion. 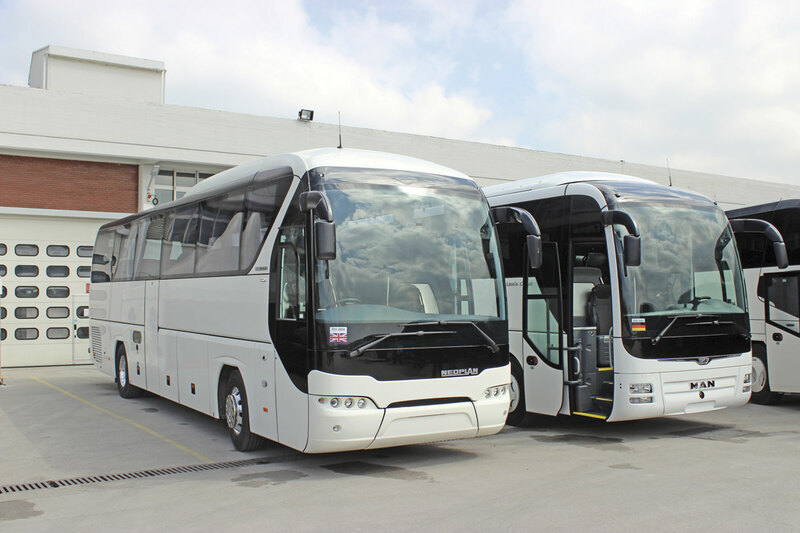 It has been building the MAN Lion’s Coach and the Neoplan Tourliner among other models for Europe for many years and is capable of building anything (except certain low entry models) from the integral ranges of the two brands. Since the announcement that Plauen is to cease production it has become the new home of Neoplan and all models will now be built here, including the Starliner double deck coach, pre-production examples of which were to be seen on the lines scheduled for delivery in April/May. 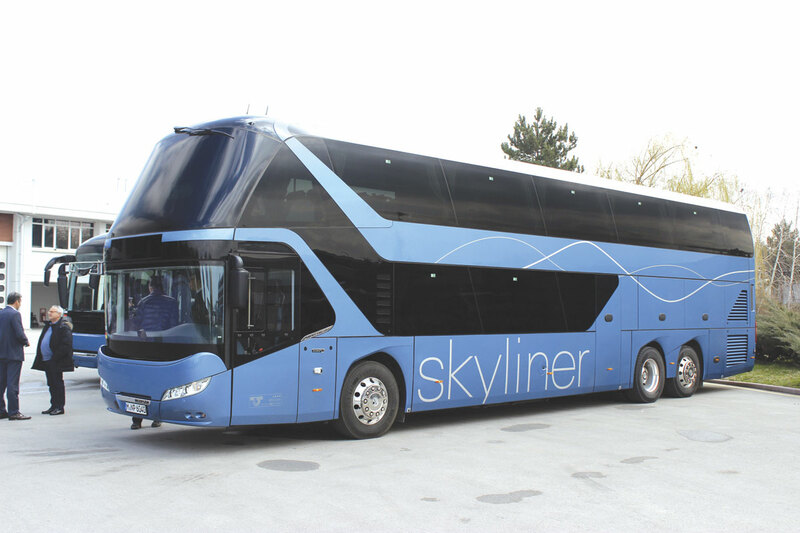 The official start of Skyliner production will be 15 July with around 30 deliveries expected this year and a target of 150 a year by 2017. With a production area of over 317,000 square metres, Ankara employs 1,600 people of which 346 are white collar and 1,253 are blue collar. I joined a tour of the plant that was so clean you’d have thought it had just opened. I reckoned things had been spivved up for our visit but regular visitors assured me it is the norm and that under plant manager, Munur Yavuz, who spent ten years at Toyota and was COO of Karsan prior to joining MAN, keeping the plant tidy and smart is part of the philosophy of quality. Production starts with the integral frame or skeleton, which is constructed from six separate sections that have been built on large jigs and are then brought together in marriage jigs. 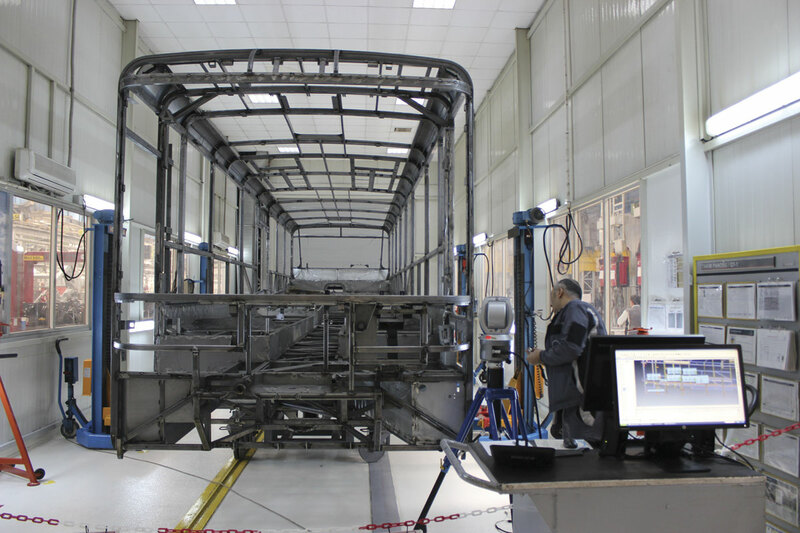 Four types of jig enable the construction of premium coaches, city buses and other coach models, intercity buses and double deck coaches. Ankara is the only MAN plant that can handle all models. We were shown the 3D laser measurement centre, opened in 2011, where one vehicle skeleton is randomly selected each day for detailed inspection. A check of 700 separate measurements is made. Checks are also made on components. The tolerance on a 12m coach skeleton is 0.05% which means around 6mm. The equipment can read to an accuracy of 0.001mm or 1/1000th of a millimetre. After the galvanised panelling has been added and checked, the frame goes on to the cataphoretic dip process. Installed in 2011 at a cost of €10m, it is one of the largest such plants in the world and was described by Heinz Jurgen Löw as ‘the best corrosion protection available,’ coating each vehicle to a thickness of 25 microns. Capable of handling 2,000 skeletons annually, it has 11 tanks in which the frame is degreased, rinsed, activated, zinc phosphated, rinsed, undergoes passivation, rinsed again, cataphoretically coated, undergoes what are described as stages UF1 and UF2 and finally there is a dripping stage. Two 12 tonne cranes transfer the skeletons between stages. After corrosion protection, metal surfaces are sealed, the front, rear and roof panels are bonded in place and the exterior flaps are mounted before painting takes place in new cabins. 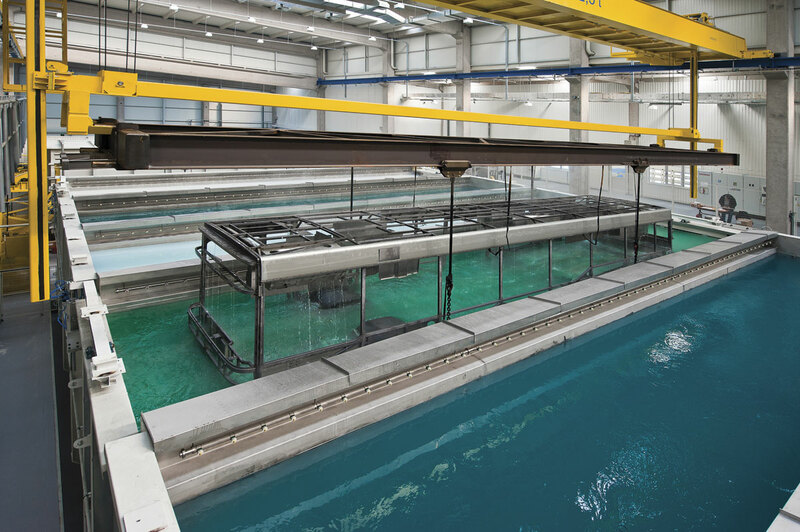 These represent a €3m investment and became fully operational in January this year. Paint quality has been significantly improved as a result. 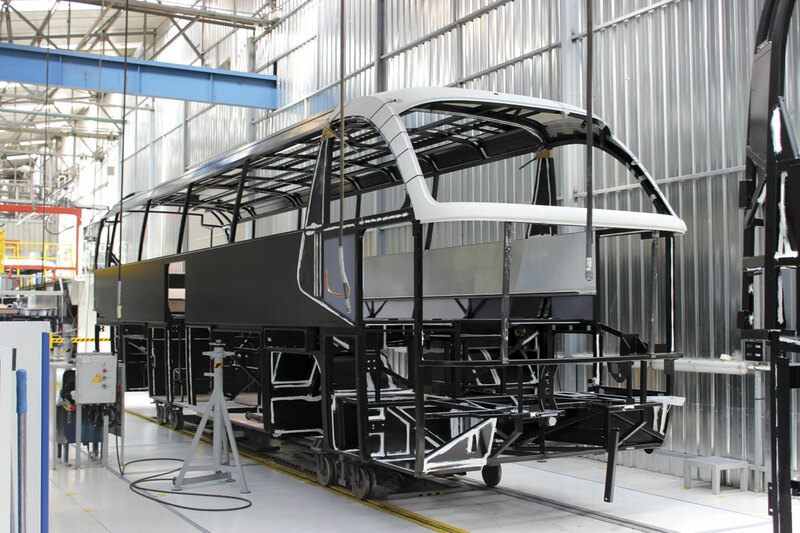 With painting complete, frames join the mechanical assembly line where the driveline, air conditioning, wiring harnesses, and glass are installed at 15 stations. All steel and copper pipes for the heating, cooling and hydraulic systems have been produced in house in a one-piece flow system since 2008. Driveline parts arrive from Germany with the chassis number attached. Throughout the build process there are a series of ‘Green Point Quality Gates’ as well as three finishing gates. At Quality Gate Six, the last of them, the bus is inspected from the customer’s perspective before going to the finishing process. Finally, the finishing centre’s 30 stations complete and check every aspect of the bus. A number of projects have been introduced, in addition to the previously mentioned quality checks, to drive up the quality of vehicles. Within the ‘Standardisation Project’ are the WSS Work Standard Sheet and the SWA Standard Work Assessment. There are 24,000 separate WSS sheets showing what has to be done, how it has to be done and why each job has to be done. The SWA process ensures that the 24,000 WSS sheets are always kept up to date. Another initiative, introduced in 2014, is the Champions Bus. 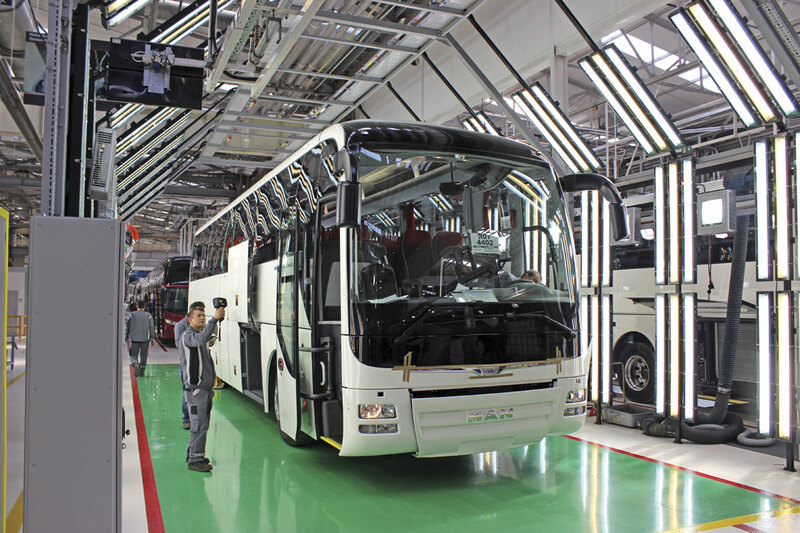 One vehicle each month is called the Champions Bus and everyone in the plant knows that the target is that it should have the minimum damage, faults and missing parts possible. Every process on it is monitored and any faults discussed, in a process that seeks to create a benchmark of excellence for all of production. The final stage we were shown was the audit room where a re-check of a randomly selected coach that has already completed all other processes and checks is carried out. Built to Volkswagen standards and opened in 2014, it is extremely well lit in order that everything, including all systems and every aspect of the interior, can be checked in great detail. Currently, production is running at seven vehicles a day. Illustrating the lean manufacturing processes adopted is the huge reduction in the amount of work in progress at any one time. 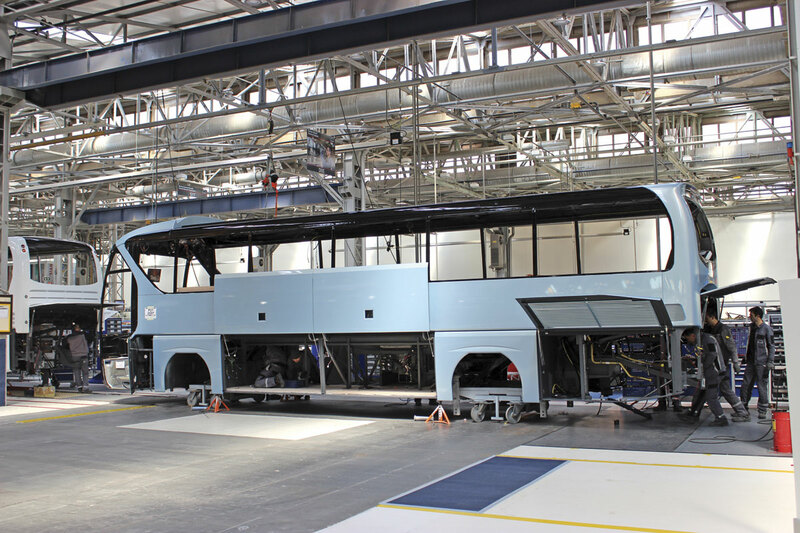 In 2010 there were 232 buses in the various build stages at one time, that figure is now down to 120 at the same overall production levels. Lead times have dropped from 29 to 22 days and the new target is to reduce that to only 18 days. I understand that the number of people employed has increased, but because of demand rather than revised processes. 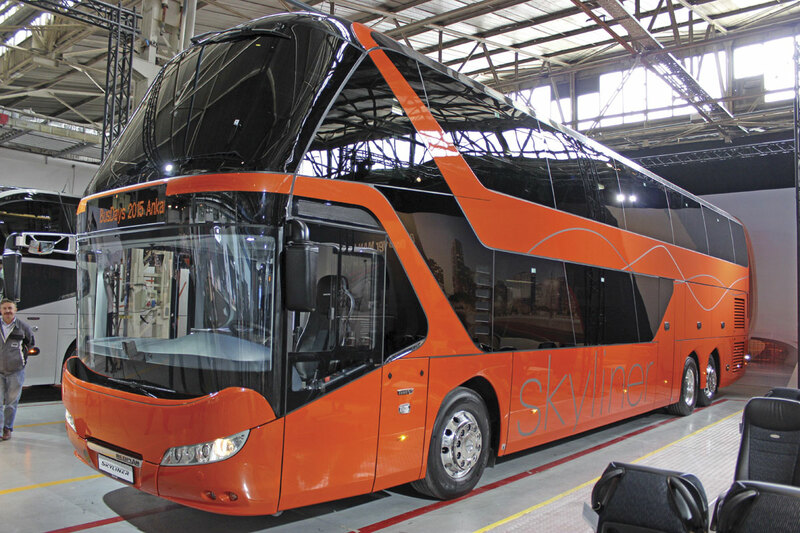 Unusually for a leading manufacturer, the plant undertakes the manufacture of shells for the Turkish TCV bus range offered by the Bozankaya group, which does not compete with the MAN range because it is in a much lower price bracket. I was told that for this reason, the availability of capacity in the plant, and the contribution it makes to the efficiency, the deal had been agreed, though MAN has the right to terminate it at any time. No TCV buses were going through during the visit, and the number sold has dropped of late, though I did see a man in a Bozankaya jacket in the plant. An unusual aspect of the Ankara facility, and one that I have not seen at any other factory around the world, is that it has its own small zoo within an attractive recreation area created by the staff themselves. Christened Jurassic Park, with an arched entry to match, I took a walk through it, seeing the exotic birds, goats and other animals. I mentioned earlier an ongoing role for the Plauen plant and this will see it become MAN’s Bus Modification Centre (BMC). In a broad role, it will complete specialist interior work including quite small changes requested by operators, all the way through to complete specialist interior modifications. MAN has done well in attracting custom from leading European football clubs and other high profile sports teams and organisations: this will be completed by the BMC in future as well as specialist non PSV applications such as libraries, prison buses or political battle buses. In addition to work on new coaches, it will also undertake the modification of used vehicles. I questioned whether this work was sufficient to keep Plauen open in the long term and was told that in addition the facility will be fulfilling a truck component production and painting role making use of the extensive new painting facility that was in the course of installation at the time that the cessation of manufacturing was announced. For those who may have wondered, with the dropping of the Starliner, there will have been a total of 848 Starliner 2s built. 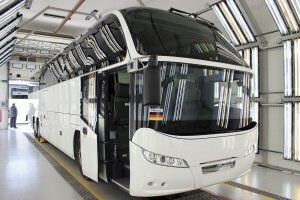 Prior to the move to Ankara 1,900 Cityliner 2s will have been built at Plauen and before that at Pilsting. The very last Starliner will be a 12.99m P11 model which will go to Engeloch of Bern in Switzerland at the end of April. The big reveal involved a completely new model called the Lion’s Intercity. It is intended that this will primarily appeal to the French and to a lesser extent the Italian and German markets where there is a relatively strong demand for low specification high capacity models that cover relatively low mileages on work based around the carriage of school and college children. 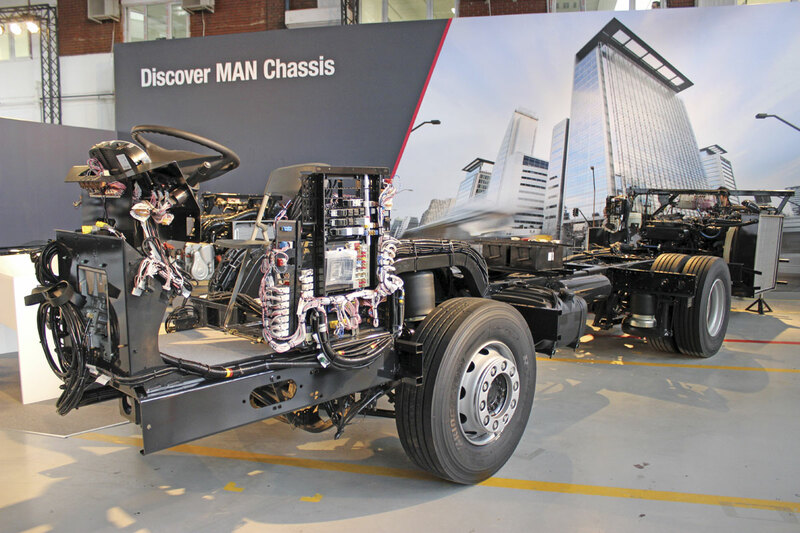 MAN used to supply as many as 400 A91/RR8 chassis annually in France in conjunction with Fast, but the closure of Fast’s bus building operations and the highly competitive prices at which competing vehicles, especially the Iveco Crossway and Mercedes-Benz Intouro, have been offered have left it at a commercial disadvantage in offering the D20 engined Lion’s Regio. I understand that the new product costs between €150-180,000 depending on specification (you can delete the air conditioning, racks, multi-function steering wheel and opt for a manual gearbox). This is around 20% less in price than the Lion’s Regio and the hope is that it will help MAN to regain and in time exceed its previous position. Most competitors in this sector are essentially box-like because it is the only way to achieve the necessary capacity, but despite this the designers have managed to create an attractive look, helped by a very rounded profile that has benefits in relatively low drag coefficient figures. MAN claim that the drag coefficient figure of 0.40Cd achieved is best in class. 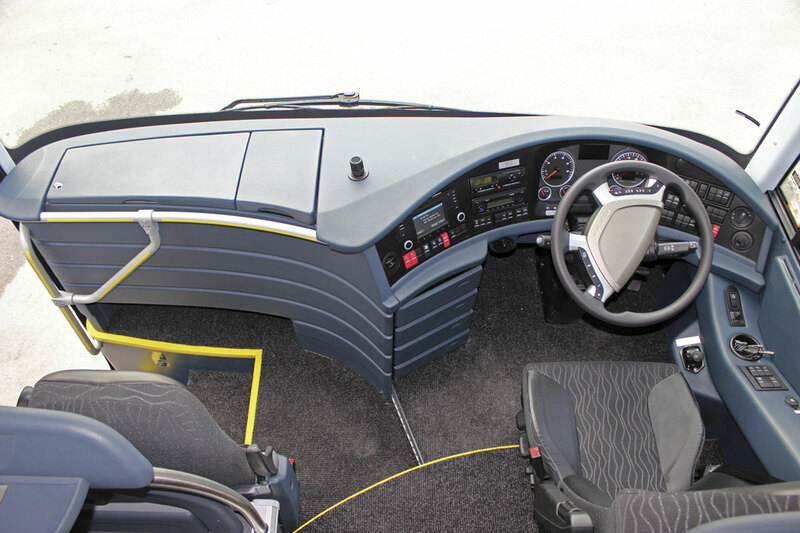 Significantly, it is said to be the first bus to meet the revised ECE R66.02 rollover regulation standards that are to be introduced in 2017. Electronic Emergency Brake Assist (EBA) will follow in 2016. Power comes from a vertical 6.871-litre D0836 six-cylinder engine developing 290hp/213kW at 1,100rpm. It is matched to a six-speed ZF Ecolife fully automatic transmission. Initially two options are available, both on two axles, though other variants will follow. The shorter of the two is the 12.3m (12.28m) long model while the longer is the 13.0m Lion’s Intercity C. Both are 2.55m wide and 3.40m high over the air conditioning pod. They have a dual door arrangement with the second door in the centre and the possibility of a cassette mounted lift within the steps. 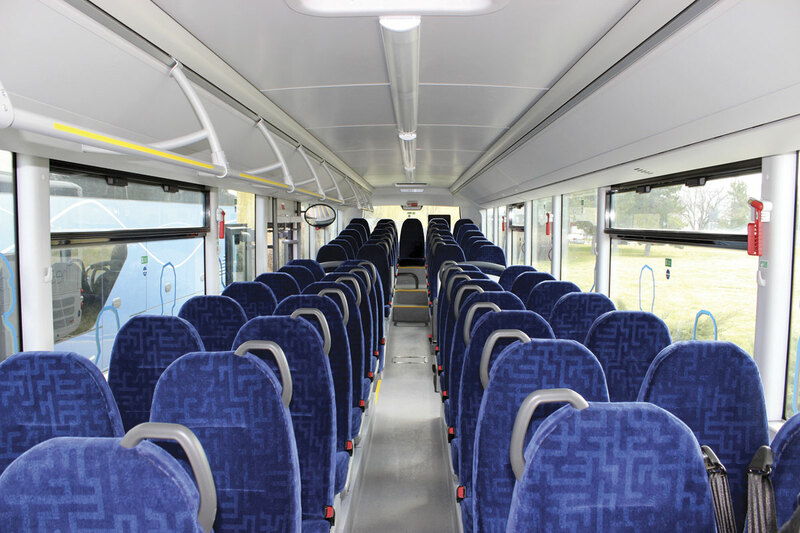 Passenger seating capacities are respectively up to 51 seats (12.3m) and 55 seats (13.0m) while the luggage capacity is 5.5 and 6.5 cubic metres. A Hubner integrated stairwell cassette lift was installed at the centre door. There is a sunken aisle which rules out 3+2 seating arrangements; I was told that these are no longer permitted in France. Apart from summer and winter testing programmes, a number of examples have already spent six months on the road in field trials with French and German operators. I travelled on a 12.3m Intercity (actually the third example built) that had spent six months with Hilschmann of Nuremberg covering 25,206km. I didn’t drive it but colleagues were impressed with its on road performance praising the suspension and directional stability as well as the quietness, and lack of wind noise and rattles. The only criticism was of a second interior mirror that partly obscured the exterior mirrors. We were told that the acceleration has been electronically limited to one metre per square second which compared to the Iveco Cursor 9 engine is 4% more economic but almost as fast (1% slower). Unladen weight was 12.2-tonnes, around 150-200kg of that accounted for by compliance with R66.02. Unlike the Lion’s Regio, the Lion’s Intercity cannot have toilet or kitchen options incorporate and the wood effect floor fitted on the demonstration coach will not be an option. However, all of MAN’s safety options, with the exception of Xenon lights, can be specified. As well as announcing the Lion’s Intercity, there was news of developments to the MAN Lion’s Coach and Neoplan Tourliner models. Drivetrain developments include new manual transmissions and the latest fully automatics from ZF and Voith. A newly developed feature called Efficient Role is to be offered from 2016. 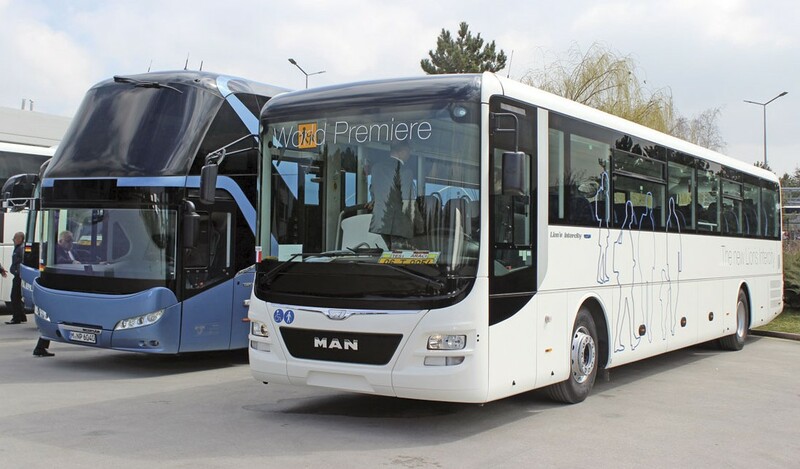 MAN has made much of the efficiency features offered to attract customers travelling longer distances and a high proportion of MAN Lion’s Coach models have been sold with the Efficiency Line package. Now a long distance package is being introduced for Neoplan models that includes TPMS, alloy wheels and a particularly fuel economic drive axle ratio. 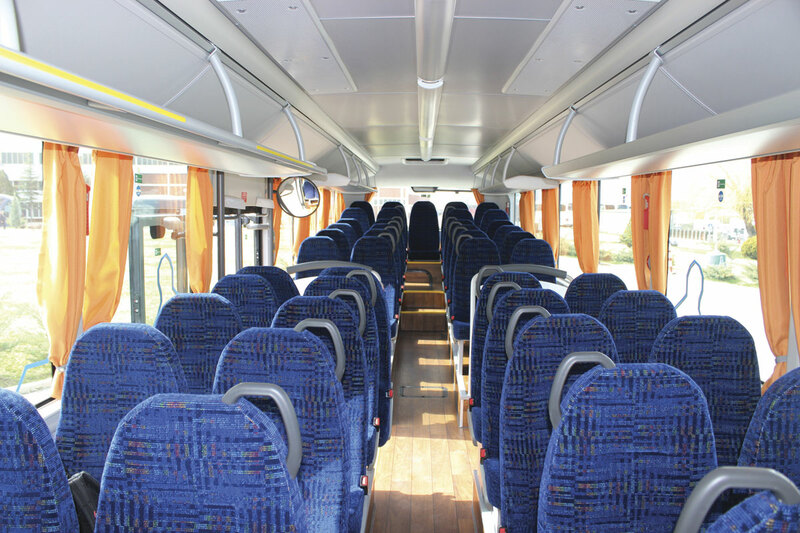 Ongoing weight saving emphasis will see new lighter weight seats and air conditioning systems introduced for the MAN Lion’s Coach. Asked about an articulated version of the hybrid city bus, the answer ‘Let’s see what the future will bring’ sounded a lot like a yes to me. Visitors to the Bus Days have traditionally been given the opportunity to both ride on and drive the various models in the MAN and Neoplan ranges and this year was no exception to that tradition. Most models in the range were available for test, among them two early examples of the Lion’s Intercity range, showing the different launch lengths and a variety of specification options. Other vehicles present included the: Neoplan Jetliner C, Neoplan Cityliner C and L, Neoplan Skyliner double deck, Neoplan Tourliner, MAN Lion’s CityLE and MAN Lion’s Coach C and MEA. Aside from the Intercity, the coach attracting the most attention was unsurprisingly the stunning Neoplan Skyliner double deck coach. MAN’s flagship, this incorporates a list of features including EBA, Adaptive Cruise Control (ACC), Lane Guard, ESP, and CDS Comfort Drive Suspension. It was said that the drag coefficient of 0.41 is best in class, contributing to a fuel saving of up to 5% compared with its competitors whilst providing the highest luggage capacity. With a capacity of up to 83 passengers, it emits less than 10gm of Co2 per passenger per 100km. I spent around half an hour on a Skyliner, most of it on the upper deck, and it is rather wonderful. The ride is extremely smooth on highways but less so on poor surfaces. Everything about it was quality. One vehicle not present was the Lion’s Regio intercity coach which I have always considered a very stylish model. Asked whether it’s omission from the line up meant that it was being dropped, Rudi Kuchta, MAN’s Senior Vice President, Sales Management – Bus, assured me that this was not the case and it remained part of the portfolio, placed a little way above the new Lion’s Intercity. There was even a right hand drive Neoplan Tourliner P21 two-axle coach displayed adjacent to the entrance to the hall where the main customer event was staged. Within the hall was a selection of vehicles, this time more brightly painted, representing the range. In most cases theses duplicated those available for test drive but many featured different aspects of their specifications. This was especially true of the 13.8m Tourliner L shown as it incorporated only 33 spacious MAN VIP seats installed in a 2+1 layout with a wider than normal offset gangway. It made for a really comfortable and high class interior. Interestingly, the P20, P21 and P22 designations for the 13m, 12.3m and 13.8m Tourliners are never used in Europe other than internally. Among the other static exhibits shown were a Neoplan Starliner in bright orange, a MAN Lion’s Coach Efficient Line in a livery commemorating 100 years of MAN bus and coach production, a Lion’s City LE low entry city bus, a 12.99m Neoplan Cityliner C and a 12.28m Lion’s Intercity in bright blue with 49 Intercity Lite seats and a standee capacity of 29. Noteworthy were two unbodied chassis. These are not produced in Ankara but at the Salzgitter facility. Those shown were a Lion’s Chassis Low Entry LE 19.290 and a Lion’s Chassis Coach CO 19.360 two-axle chassis with D2066 LOH 360hp/265kW engine. 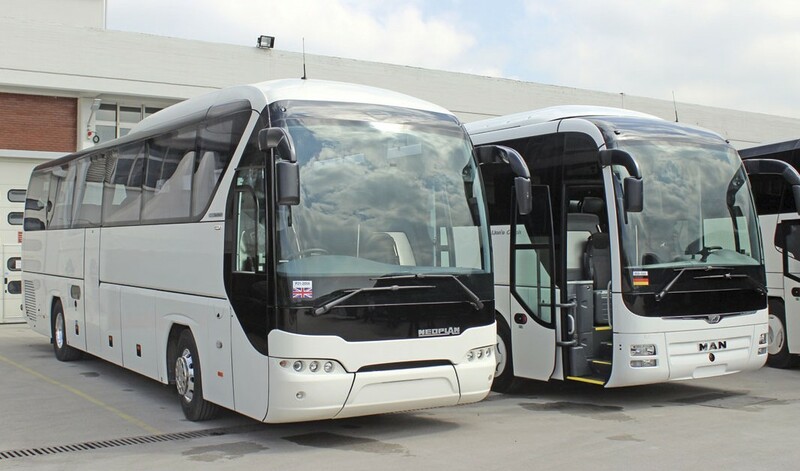 The Neoplan Tourliner will continue to be offered in the UK in all three of its guises, and in addition will be offered in a new format with a flat floor and 2+1 executive seating with a spacious offset aisle. With the discontinuation of the Starliner, there had been thought given to making the Cityliner available in right hand drive, with a forum on the topic held last year, but it has now been confirmed that this will not happen. 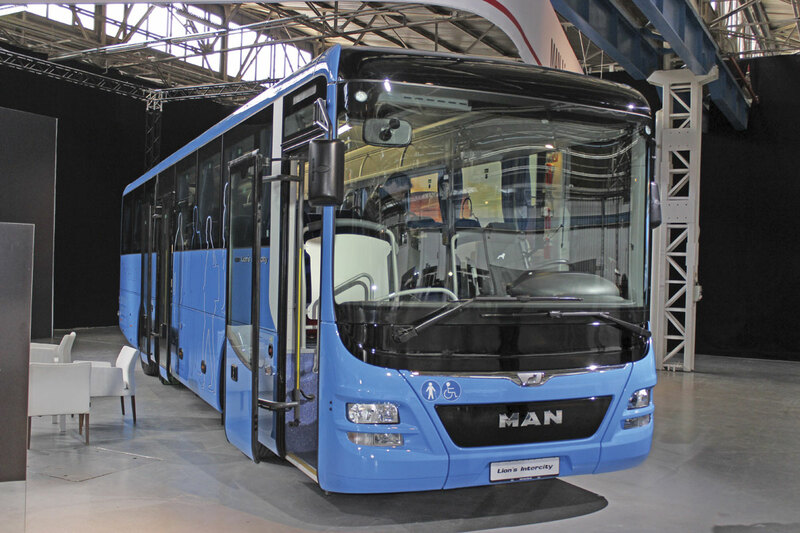 Neither are there any plans to offer any other members of the MAN integral bus and coach ranges in the immediate future. Despite the lack of product, MAN does remain committed to the UK. 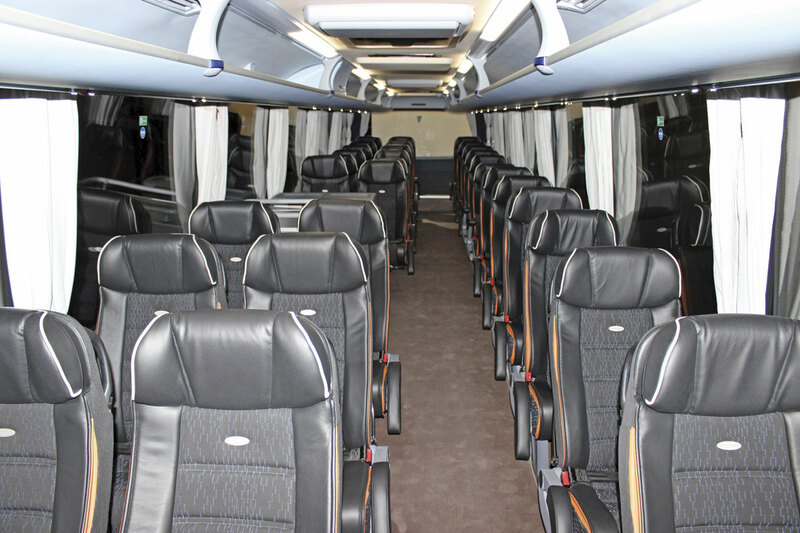 New contract hire packages are to be made available on Tourliner. Furthermore, all Tourliners will be sold with an R&M and telematics package. On the body on chassis side there are more positive signs than there were a year ago with BASE Coach Sales now offering MAN chassis with Italian Barbi and Portuguese MobiPeople bodies, while the Beulas franchise has passed to the associated Moseley Group of Companies whose three dealerships, Moseley PCV, Moseley in the South and Moseley Distributors will all be offering a variety of options from the well regarded Spanish coachbuilders. One new market for MAN that is being exploited with a derivative of the TGL truck chassis is the midi sector. Following Daimler’s withdrawal of the Vario after so many years, both NuTrack and BASE working with MobiPeople have begun offering TGL based vehicles. In the past the used coach situation at the Manchester site had been out of hand but this is back under control. Now operating under the TopUsed banner as elsewhere in Europe, stocks are down to only 18 units, and at the time of writing all of these were MAN/Neoplan products. Bus sales have been limited over the past two years but the CNG fuelled EcoCity, which combine an MAN gas powered underframe and an Alusuisse Caetano body, is very much still available and there have already been enquiries following the announcement of the new OLEV green bus grant. The UK team will be hoping that these can be converted into orders. 2015 marks 100 years since MAN built its first bus. There were references to it during presentations and as mentioned, one of the coaches was in a livery celebrating the centenary, but as I believe there will be events on the theme later in the year I will hold off on this until then. Orders may not be over abundant in the UK but significant orders have been won elsewhere in Europe as well as further afield, including some right hand drive markets. MAN claims to be the number one supplier of CNG buses in Europe, recent order including 125 for Sofia, 136 for Stockholm (it is currently number one in the Swedish city bus market) and 88 for RATP in Paris which has also taken 53 hybrids. Deutsche Bahn is to take 800 diesel buses between 2015-2018. Outside Europe, Israeli operator DAN is taking 166 A22 buses, IAMSA of Mexico is taking 150 RR4 double deck coaches with Ayats bodies, SAPTCO of Saudi Arabia is taking 250 A47 buses to a special design, and in Bahrain National Express is taking 127 A66 and RC2 chassis. A few years ago MAN did try to launch a new right hand drive double deck bus with super single rear tyres into the UK market, the solitary example carrying lowheight East Lancs bodywork and spending a while in the fleet of Reading Buses. Now MAN is once again investing in the double deck market and the product is right hand drive, but it is not envisaged that it will be offered in the UK because it is 13.8m long on three axles and there is not thought to be demand for it. It has been developed for Singapore and Hong Kong. MAN is already doing very well in Singapore having supplied 700 buses, a mixture of A22 and articulated A24 models, to SMRT. Bodywork is by the Malaysian builder Gemilang which has worked with Dennis in the past. A test vehicle has already been built. It features a Euro5 D20 engine but Euro6 versions will follow. Gearbox options are either ZF or Voith automatics. MAN has made promises about customer support in the past and failed to deliver, this time it simply has to. There are many encouraging signs, not the least of which are the transformation of the Ankara factory, the attitude of Director of Sales & Marketing Heinz-Jurgen Löw and his team, and the appointment of Andreas Renschler. In the UK, the new MD of MAN Truck & Bus UK, Simon Elliott, has a reputation from his days with Volkswagen for attention to customer satisfaction. Areas of the product line up have needed renewing and though it won’t be coming to the UK the introduction of the Intercity is an excellent step, enabling a challenge to Iveco’s Crossway that the Lion’s Regio was too expensive to achieve. 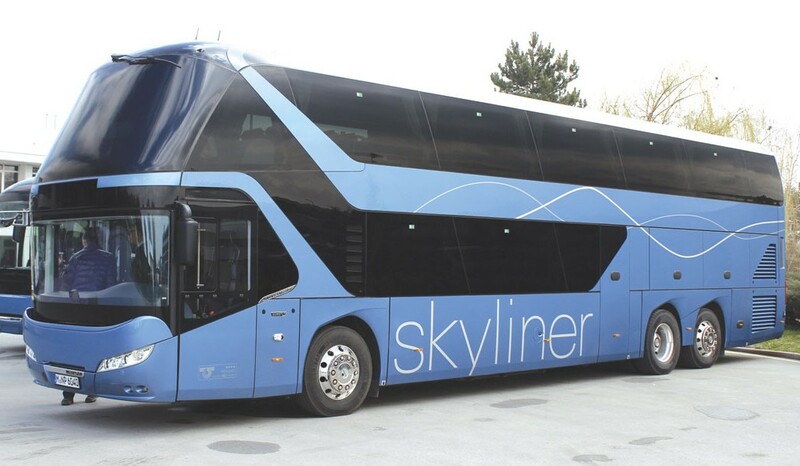 The Skyliner finally entering the market is another move long overdue. 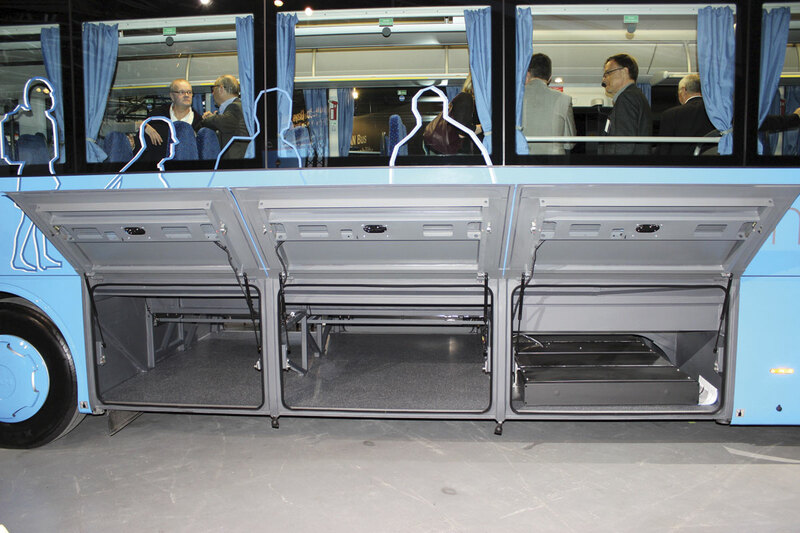 For the UK the range on offer is still disappointingly narrow but the availability of a flat floor in the Tourliner, permitting 2+1 seating is something, though potentially less important than a support network in tune with coach operator’s needs would be. MAN still has a long way to go to satisfy operators but the signs are more promising than they have been for a long time.